Established in 2007, Stone Jewelry Box basically started out as a hobby for the creators to make their own jewelry. As a result, many compliments arouse from the very first necklace set and an offer was made to buy the very first piece. Since then many more requests were made from several other potential buyers, creating what is now known as Stone Jewelry Box. As the popularity in Stone Jewelry Box increased greatly, new original and custom designs were created and loved by many. Because of you and your love for our pieces, we here at StoneJewelryBox.com are excited and delighted to create more new original designs to suite all your jewelry needs for every occasion. In our minds, we believe that beautiful fine jewelry should be affordable for every lifestyle. To achieve this, we here at StoneJewelryBox.com give everyone the opportunity to purchase semi-precious gemstone, glass and metal jewelry. These pieces are rarely duplicated and original, making your unique purchase even more special. We understand that finding that one of a kind piece is more special because everyone has his or her own unique style. We pride ourselves on finding that style for every individual. In our spare time, we enjoy being rockhounds. This allows us to obtain greater knowledge and understanding of minerals we use here on StoneJewerlyBox.com and for ourselves. 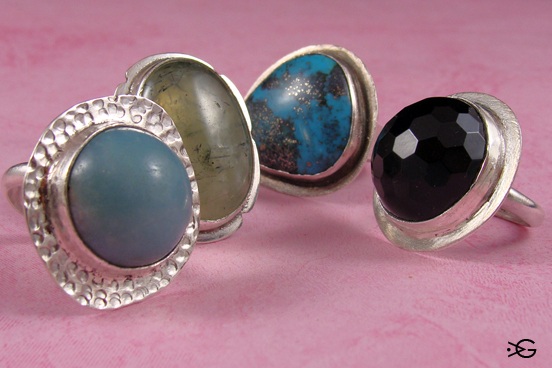 We love to also think of our pieces as conversation pieces because of the knowledge we have acquired being rockhounds. There are many places that we love to travel because there are so many stones and minerals that can be found throughout the United States and abroad. As we grow and continue to update our site we hope to give you the opportunity to share some of this knowledge with you. We hope that you will truely love our pieces as we do, and if you have any questions or concerns please contact us. Thank you for your love and support of Stone Jewelry Box.